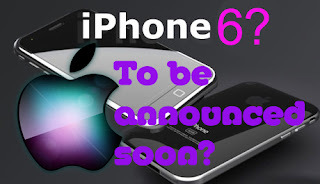 Life of a mad typer: Iphone 6? Coming soon? So word online that the iPhone will be announced soon but when is still an argument. At first there were people saying the 18th and then changed to the 16th but the conference is tomorrow so the new date and time is 9/12/2012 12pm. So tomorrow we will know whats going on! I am glad that this year I will be off during the time of the conference so I should be able to catch it online. This will be my first year watching as I usually work day shift and would not be at a pc to watch but working nights I'll be up but I'll be very very tired. I can't wait for the new 6.0 software for one. The new mapping system sounds amazing (too bad I just bought a garmin huh? lol) but I will play with it even if I have no use for it. The pass book is really exciting to me because I am always loosing coupons and my cards so yay! "Now when you decline an incoming call, you can instantly reply with a text message or set a callback reminder. And when things are just too hectic, turn on Do Not Disturb and you won’t be bothered by anyone — except can’t-miss contacts like your boss or your better half." ~ Now this update is the one I have been waiting for! Do you know how many times the Old Man has been locked outside and I didn't know because I had my phone on silent because of the constant flow of notifications? Well let's just say it's happened ALOT and this feature is awesome that I would be able to set it so his calls come through but nothing else! WAY TO GO APPLE! Took you long enough. Adding pictures to an email from a composed email instead of canceling message to go to photo app to then redo the message is finally here. I'm sad to say that I'm ashamed it took apple this long to do it! Oh and a slightly Bigger screen would be appreciated. So what is on your apple wish list? What features are you most looking forward to?